Location: Blue Marine Aparthotel is located in close proximity to beach in the southern part of Sunny Beach, just a few minutes walk from Cacao Beach. Bourgas Airport is just 30km from Blue Marine Apart Hotel. Accommodation: The complex offers accommodation in luxury studios, one and two bedroom apartments. All the apartments are fully furnished with air conditioning, fully equipped kitchen including a refrigerator, a balcony with table and chairs. 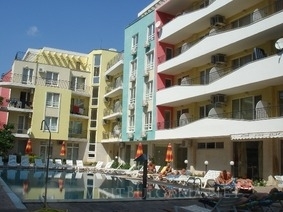 - Maximum occupancy in a studio - 2 persons on regular beds plus 1 on an extra bed. - Maximum occupancy in a 1-bedroom apartment - 2 persons on regular beds plus 2 on extra beds. - Maximum occupancy in a 2-bedroom apartment - 4 persons on regular beds plus 2 on extra beds. Comforts in the complex: Blue Marine Aparthotel is a gated complex, offering pool area with sun beds. There is also a cosy restaurant serving delicious international cuisine.